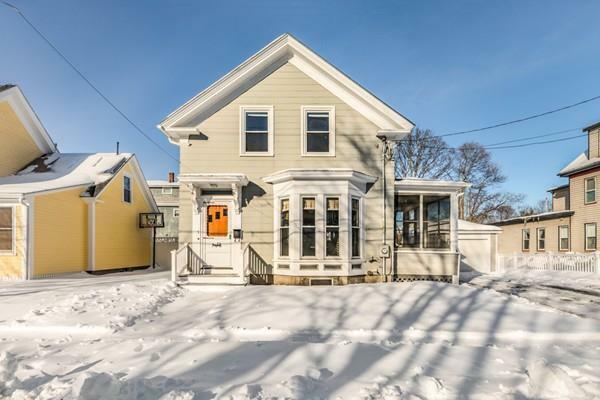 Nestled in a wonderful neighborhood of large older homes and only 1/2 mile to all that Stoneham Center has to offer, sits this Sun Filled Charming Colonial just waiting for its next new owners. The 9ft ceilings and large windows along with the built-ins, original wood trim and tons of storage are sure to please you! Level one offers an OPEN Concept Living Room, Dining Room and Kitchen, along with a 1st Floor Bedroom and Full Bath. The enclosed 3 season Sunroom adds additional space for relaxing in the warmer months. The second floor boasts two lovely bedrooms with walk-in closets and a second full bathroom with laundry. The one car garage, driveway parking for 4 cars, fenced yard, and the 6 Year Young Renovations of the Roof, Heating System, Kitchen, Baths and 200 Amp Electrical Service will make you want to make this great home your own.